I'm excited to say that today I started a new job as the Executive Director of the .NET Foundation. The .NET Foundation is an independent non-profit organization set up to foster open development, innovation and collaboration around the Microsoft .NET development framework. It's been going a year now and I've been involved with the team from the beginning, but it's fabulously exciting to be an active part of it now. Also quite scary - the team is fantastic with some of the smartest people on the planet, so my job initially is to figure out how to keep out their way as they do awesome stuff while figuring out what I can do to help unblock more openness and innovation by ensuring that the wider community is always involved along the way. I'll still be an employee of Microsoft but my job is now to focus 100% of my time on the .NET Foundation helping co-ordinate lots of the day-to-day operations of the non-profit organization but also set the strategy and tone for the future. If folks have ideas then please head over to the .NET Foundation Forums and post your suggestions. You can always reach out to me on Twitter(@martinwoodward) or my new work email address (martin@dotnetfoundation.org). It's an incredibly exciting time to join the team as they are doing some amazing stuff. .NET as a platform is going through rapid innovation at the moment. But more importantly the project teams are working in the open and are focused heavily on responding to pull requests that come in and taking the platform forward with wider community participation which I see as a very good sign. The .NET Community has always been a passionate one, and a place in which I have found many of my friends. But it is a friendly one as well. I was always the "Mac guy" or the "Eclipse guy" when it came to .NET User Group meetings yet I never felt an outsider - everyone has always been very welcoming and just keen to learn more from one and other. The MVP and RD communities around .NET contain so many passionate, dedicated and smart people. It's a fantastic time to be involved in .NET. We're at an inflection point in the platforms history and all signs are that things are heading to some very good places indeed. Now I just need to not mess up and do what I can to help make sure the .NET Community continues to be a great place to be. Drop me a line if you have any ideas, suggestions or feedback as to what I can do to help. Over the past couple of weeks I’ve had several people ask me about my dev environment for working with Git on Windows so I decided to write it up here for me to point people to. 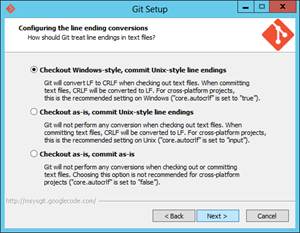 Of course the first thing that you want is Visual Studio 2013 with the built in Git tooling. While I’m obviously very biased in terms of the Visual Studio tools I’m actually more familiar with the command line workflow – especially coming from the Mac. However the team specifically designed the Visual Studio tools to work well with the command line and compliment them – I find myself swapping more and more between the command line and the UI depending on what’s quickest for me. I NEVER use the command line for merging any more, but I still use if for dealing with multiple remotes (very common in OSS workflows) squashing and rebasing my commits etc. There are some things I actually find myself using Visual Studio for that I never thought I would. For example I quite often find myself swapping my email address around when I’m doing commits for work or if I’m working on a demo or a side project and I’ve noticed I’ve been using the Git settings panel in Team Explorer more and more rather than going to “git config” which surprised me. So, how do I set up my command line Git experience? 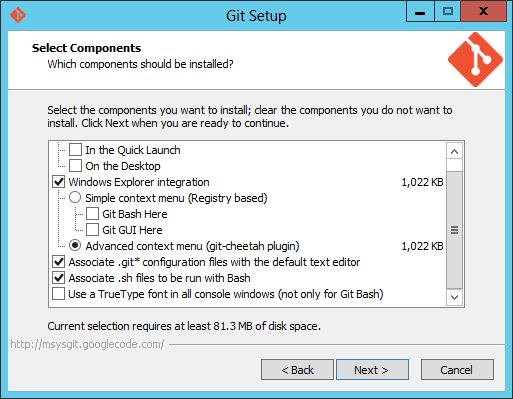 First of all you have to install Git for Windows of course. I always use the .exe installer from here (ignore the –preview moniker, they are good – at the time of writing the latest is Git-1.8.5.2-preview20131230.exe). Now one of the first mistakes I see people do is go for the default options in the installer which results is people using Git Bash. 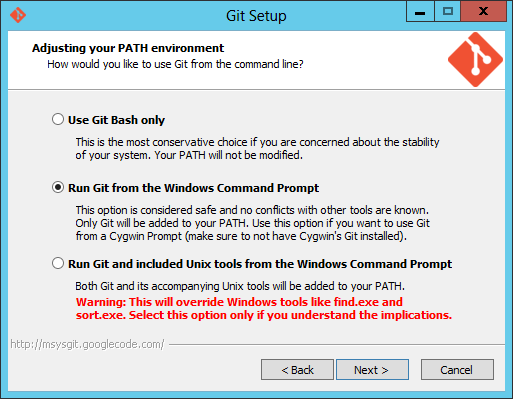 If you love yourself don’t do that, but make sure Git is added to your path. On the screens that I need to make decisions on, I always follow this path. For component selection, I generally go for the defaults. I don’t use the shell extensions personally but they don’t hurt. This is the important one being the change to make sure Git is added to your Path. 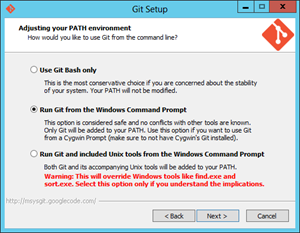 This makes sure that you can go to the command shell or PowerShell and run Git. The Git Bash shell is evil IMHO, I never find myself using it despite using Bash all the time when I’m on *nix. Then I go with the default of setting the CRLF behaviour to normalize as Unix style endings in the commits. Basically this makes sure a commit generated on Windows is the same as one done on the Mac or on Linux but also that you can still use notepad if you check out a file that was edited in Vim on Linux. The next thing I install is PoshGit. I swear, PoshGit is the main reason to use the PowerShell console (that and also the fact it doesn’t shout at you when you accidentally type “ls” instead of “dir”) Installation of PoshGit can be a bit quirky but Keith’s instructions are pretty good. Basically, after he’s helped you make sure your PowerShell environment is set up correctly, you clone the repo (git clone https://github.com/dahlbyk/posh-git.git), cd into it and then run the install script. git-credential-winstore.exe -I "C:\Program Files (x86)\Git\bin\git.exe"
Combined with with web interface in TFS, Visual Studio 2013 and Eclipse with egit, that’s all I need personally. However if you want a graphical view of your repository then a lot of people use gitk which is installed with Git for Windows (just type “gitk” inside your repo in the command shell / powershell windows). 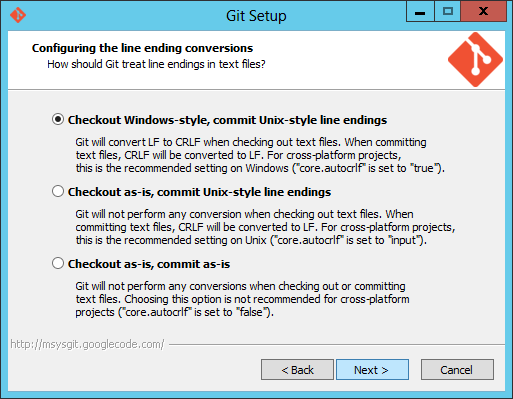 You can also type “git gui” for the git-gui tools. Other popular graphical tools you might want to install are GitHub’s free app GitHub for Windows and Atlassian’s free app SourceTree. GitHub for Windows is very pretty and great for managing your GitHub based repos. Atlassian’s SourceTree is very highly regarded as stand-alone UI for working with Git repos on Windows. 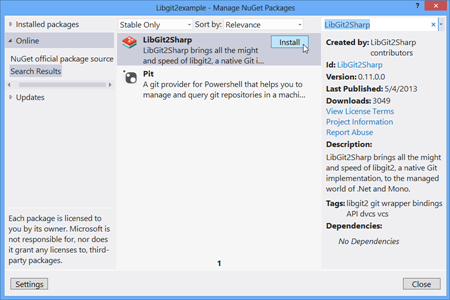 If you want to work with your local Git repositories in some .NET code then LibGit2Sharp is your friend. It’s the open source library used by the Visual Studio Tools for Git and gives you a very idiomatic way to talk to Git from C# or VB.NET. I thought it would be worth a quick tutorial post showing how easy it is to get started by querying a repository helping us learn a bit about the library but also learn more about Git itself. As LibGit2Sharp is open source in this example I’m going to point to cloned copy of the repository I have locally already by using the Git tooling in Visual Studio or by typing git clone https://github.com/libgit2/libgit2sharp.git. However you can obviously point to any Git repository you already have locally. To begin, create a new console project in Visual Studio. 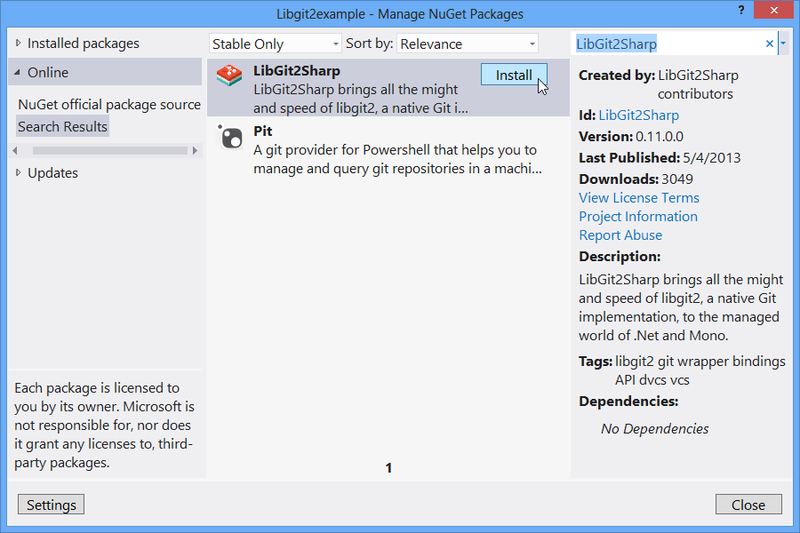 We need to add a reference to the Lib2Sharp library and the quickest way to do that is to open the NuGet package manager by right-clicking on your project in Solution Explorer and select Manage NuGet Packages… Search online for “LibGit2Sharp” and Install. Then accessing an existing repo is trivial, simply use the LibGit2Sharp.Repository class. A handy way to get a particular commit is by its hash if you know it. A point in time in the repository is represented by a Commit. Each Commit points to a Tree which you can think of as a directory/folder. A Tree can contain a Blob (i.e. the contents of a file) or another Tree (i.e. a sub-folder). This post obviously just scratches at the surface of what is possible with LibGit2Sharp. We’re starting the process of trying to flesh out the documentation for the project from the current starting position of none, but it the meantime if you want to see some more examples of using LibGit2Sharp then take a look at the Unit Tests. First things first, I had to get Java installed. It sounds like Oracle are working on a version of Java with a proper Hotspot JVM – but I just went with a vanilla OpenJDK build for the device that lacks important features like a JIT etc. It’s all fully functional, just the performance isn’t great but sticking to the TFS cross-platform command line client (tf) in Team Explorer Everywhere, performance is usable and will only get better as better JVM’s come available for the Raspberry Pi. I ran the native build process, and amazingly all the unit tests passed! I then checked the Linux/Arm natives back into TFS, waiting for the CI build to finish and then downloaded a new TFS-CLC.zip from the build server. Unzipped the standard CLC into my users ~/Bin directory and it just worked! I can now happily talk to my local TFS server from my $25 Raspberry Pi. 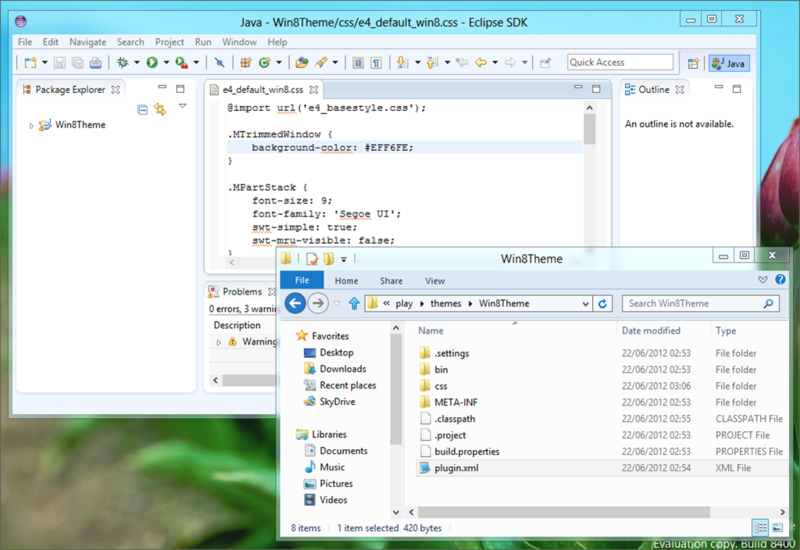 With local workspaces and transparent execute bit support in TFS 2012 it’s a really good experience. I just use vim to edit files, do a quick “tf status” to see what's changed and then a “tf checkin” to add the files to source control. I’ve actually added the Linux on Arm natives into the main build of TEE so they might appear in the RTM version of Team Explorer Everywhere if I don’t find any major bugs. 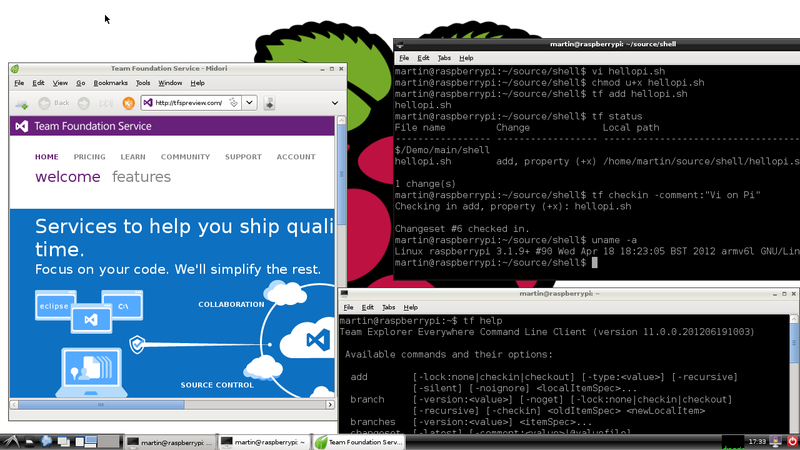 It definitely wouldn’t be classed as a supported platform or anything, but it certainly “works on my machine”. Possibly more useful is that if the Arm natives also ship in our TFS SDK for Java it would mean any Java applications coded on the Raspberry Pi in the future would have full access to the same TFS API that we use to create the command line client and the Eclipse plug-ins. Update: I was getting some questions on Twitter, so just to explain how small this device is here is a picture of it against my Microsoft ID Card (which is credit card sized). The Raspberry PI is almost exactly the same size. The ARM CPU on it is about the size of a thumbnail – much smaller than the HDMI and Ethernet connection it is attached to. Really nice piece of kit for $25 if you can get hold of one. All this was anti-climatically easy. 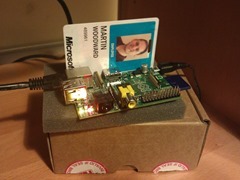 I’m going to have to figure out what to do as my next Raspberry Pi project. Now that I have an API I can use for TFS, I’m thinking about doing a Wallboard display application to display stats from my TFS server (such as latest build status, latest check-ins and work item assignments etc) from the device onto a cheap HDMI TV set in my office – but if anyone has any other ideas let me know. Great job to the team of folks contributingg to the community build extensions (many of which I am proud to call my friends) – I’m looking forward to seeing the project go from strength to strength now that they have their first stable release out the door.